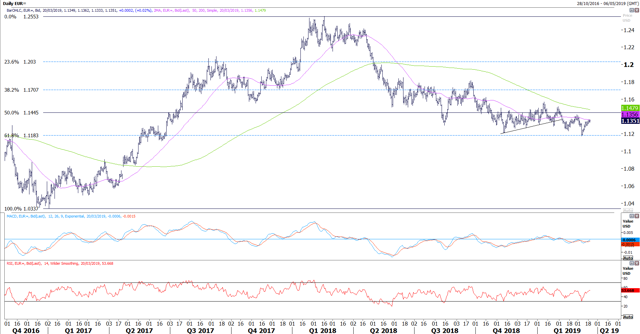 FX Weekly: Can An Improvement In Euro Macro Data Generate Some Momentum In The Euro? Global stocks continue their rally, completely erasing the Q4 equity rout despite the elevated uncertainty. The US 10Y yield has been trending down for the past two months and looks like it is going to re-test its 2.55% support reached in early January following the global sell-off. Risk-off currencies such as the Japanese yen and the Swiss franc have not depreciated very much, and both remain well-supported. This week, investors' focus will be on the FOMC statement. Comments on the balance sheet runoff in addition to the Summary of Economic Projections might generate some price action. Global: Global stocks continue their rally, ignoring the delay of the Trump-Xi meeting, which is now pushed into June. The MSCI World Index is now back to its October level, completely erasing the Q4 equity rout despite the elevated uncertainty. Sell-side institutions are currently pricing in another 7 days before CTAs start buying again if the market does not experience a tactical consolidation. There are numerous reasons why we are still skeptical about the global rally in equities since the start of the year: uncertainty remains elevated (even though the Global EPU index has been falling in the past two months), and global yields have not risen this quarter. The US 10Y yield has been trending down over the past two months and looks like it is going to re-test its 2.55% support reached in early January following the global sell-off. In addition, risk-off currencies such as the Japanese yen and the Swiss franc have not depreciated very much, and both remain well-supported. This week, investors’ focus will be on the FOMC statement; even though the Fed is expected to keep its Fed Funds rate steady at 2.25-2.5%, comments on the balance sheet runoff, in addition to the Summary of Economic Projections (SEP), might generate some price action. China: Despite recent talks on the Chinese external balance problem the country will face in the following quarters as it has now been running a current account deficit over the past year (the Chinese economy relies on FDIs and portfolio flows to hold their balance of payment steady for the time being), the stock market has continued to surge. Figure 1 (left frame) shows a significant divergence between macro data (Citi Economic Surprise Index) and the equity market over the past few weeks; according to Eikon Reuters, the Shanghai SE index is up 27% YTD. Euro: We saw some improvement in the macro data in the Euro area, with the CitiFX Economic Surprise Index rising from -88.6 in mid-January to -34.1 this week, while data in the US has continued to disappoint. 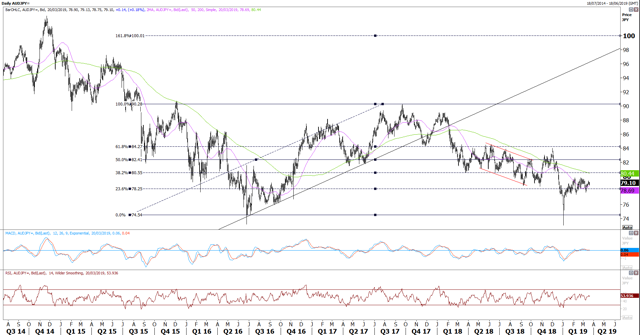 Will the macro data be enough to support the currency in the medium term? EURUSD is still significantly undervalued according to some fair value metrics; Eurostat-OECD is pricing in a "fair" exchange rate at 1.37. UK: After the MPs voted to delay Brexit last week beyond the official departure date of March 29, it is now up to European leaders to agree on that decision. Even though the improvement of market sentiment on Brexit lately generated some GBP appreciation against all the major currencies, cable was also supported by better-than-expected macro indicators in the past few weeks. The UK unemployment rate came in on Tuesday and fell to 3.9%, its lowest level since 1975, while CPI inflation ticked up to 1.9% in February. BoE is expected to keep its official bank rate steady at 0.75% on Thursday, however policymakers should start considering a hike in the coming months. Net shorts on US Treasuries have continued to decrease since the beginning of the year, down from 1.13M in early January to 794K on March 12th. Net specs on the 2Y have also collapsed to 133K, down from 417K in mid-December and now standing at their lowest level since August 2018. EURUSD: After hitting its 1.1180 support (which represents the 61.8% Fibo retracement of the 1.0340-1.2550 range) two weeks ago, the euro has been well-supported and is now back into its ST 1.1250-1.1550 range. 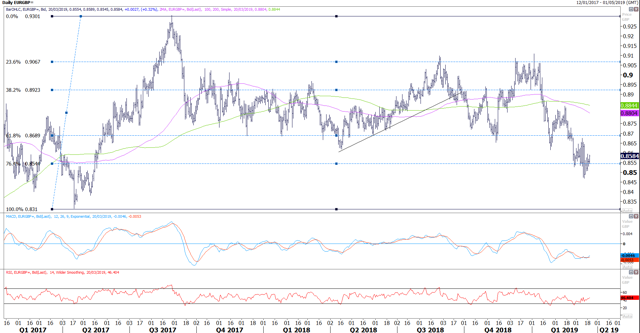 The recent improvement in economic data added some momentum in the single currency, however we will need to see stronger data in order to have a potential breakout of the range on the upside. GBPUSD: Cable experienced a spectacular rise in the past few weeks on the back of market sentiment turning positive on Brexit outcome. However, price volatility remains elevated, and we would stay out of the currency for the time being, as the probability of a sudden sell-off on the British pound remains quite elevated. EURGBP: The pair found strong support below the 0.85 level, where it was slightly oversold, and has been trading around 0.8550 over the past few days, which corresponds to the 76.4% Fibo retracement of the 0.8310-0.9300 range. Even though the trend looks bearish, we will try to buy some below 0.85 with a tight stop at 0.8440, for a potential first target at 0.86. USDJPY: The volatility on USDJPY has been compressed over the past two weeks, with the pair oscillating around 111.40, which corresponds to its 100D and 200D SMA and the 38.2% Fibo retracement of the 99.60-118.70 range. We are still short the pair at 111.10, which serves us as a hedge against a sudden rise in volatility. Interestingly, AUDJPY (Figure 5), our barometer of the risk-on / risk-off sentiment, has been fairly flat since the middle of January (oscillating around 79) despite the global recovery in stocks. USDCHF: We are also short USDCHF at 1.0080 with a first target at 0.9920. Being long the Swiss franc also serves us as a hedge against political uncertainty in the Euro area. 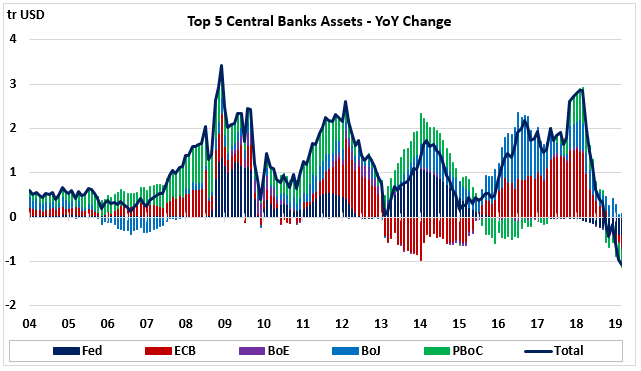 Over the past year, we saw a significant reversal in the year-on-year change of the five major central banks’ purchases. As you can see it on the chart, the 12M change switched from $2.86 trillion to a negative amount of $1.06 trillion. We previously saw that a negative annual in central banks’ assets tend to weigh on global equities in the 12 following months, and therefore, that quantitative tightening combined with the fall of real money supply could limit the upside gain on risky assets such as equities. An interesting observation in this chart is the sharp decrease in the Bank of Japan’s annual purchases of JBGs over the past three years; it fell from JPY 80 trillion in early 2017 to $30 trillion since the beginning of the month. Therefore, even though Kuroda has not officially announced a quantitative tightening, the central bank has been slowing down its YoY increase in bond purchases by an average of 3-4%, emphasizing global QT. Disclosure: I am/we are short USDJPY, USDCHF. I wrote this article myself, and it expresses my own opinions. I am not receiving compensation for it (other than from Seeking Alpha). I have no business relationship with any company whose stock is mentioned in this article.